I am ever indebted to Dr. Yoni Freedhoff, the Canadian obesity specialist, for keeping a sharp eye out for the more amazing ways food companies push junk foods. Check out his Weighty Matters blog. This particular post describes the “Smart Snacks” for kids endorsed by the Alliance for a Healthier Generation, founded by the American Heart Association in partnership with the Clinton Foundation and the Robert Wood Johnson Foundation. These are all junk foods tweaked to make them slightly less junky, thereby raising the questions I always like to ask in these situations: Is a slightly better-for-you product necessarily a good choice? In case you’re not familiar with it, the Alliance For A Healthier Generations is the name given to the partnership program founded between the American Heart Association, The Clinton Foundation, and The Robert Wood Johnson Foundation with pretty what at first glance looks like pretty much every food industry corporation on earth…[this] is a partnership with the food industry whose job is to promote sales, not to protect health. The American Heart Association should not be a participant in this Alliance. The “Smart Snacks” program’s endorsement by the Alliance covers these particular products but, by extension, the rest of those companies’ products—and the companies that make them. 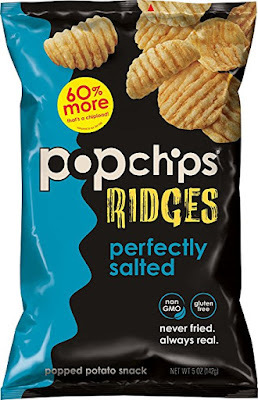 Forget potato chips. Try jellyfish chips ! I am indebted to BakeryandSnacks.com for this insight into food of the future: jellyfish snacks. Westerner that I am, I think of jellyfish as exquisite creatures pumping away in the Monterey Bay Aquarium or as horrible stinging aggressors on the beaches of Florida. Until now, I never thought of eating one. But now a recent paper extols the potential of jellyfish as chips. As an example, we have studied jellyfish – a food material mostly uncommon to the Western palate, but a delicacy in traditional Asian cuisine having a gastronomic history of more than a thousand years. It is eaten mainly for its interesting crunchy mouthfeel resulting from a month-long salt preservation using sodium chloride and alum. This preservation drastically changes the texture of the jellyfish from being gel-like to resembling that of pickled cucumbers. We have used state-of-the-art two-photon microscopy and super-resolution STED microscopy to visualize the rearrangements in the filamentous network constituting the jellyfish mesoglea gel during the transformation from a soft gel to a crunchy texture. We further interpret our data in light of polyelectrolyte theory and a modified Flory-Higgins theory that describes ionic gel collapse in poor solvent to suggest an alternative preservation method. Using ethanol, we thus have created what can be classified as jellyfish chips that has a crispy texture and could be of potential gastronomic interest. Jellyfish are widely eaten in Asia, by typically marinating the bell (or body) in salt and potassium alum for several weeks to produce a pickle-like texture. However, the Western palate is unaccustomed to this food source and the jellyfish is often described as “slimy”​ and “tasteless”. As for nutrition, jellyfish are mostly water and sea water at that; their nutritional composition is like that of sea water, high in sodium but not much else. Can’t wait to taste one. I subscribe to a bunch of newsletters, one of which is BakeryandSnacks.com. It tracks the market for baked goods and snack foods throughout the world. Here, for example, is its roundup of articles about that market in China—the fastest growing bakery market in the world. China’s bakery sector has been the most dynamic around the world – growing in double digits in the past decade – and shows no signs of slowing down, despite quickly becoming saturated with both large and artisanal Asian and foreign players. To coincide with the country’s Lunar New Year celebrations and proceeding Bakery China – Asia Pacific’s largest event for the bakery and confectionery market to be held in Shanghai in May 2018 – BakeryandSnacks examines the world’s fastest growing bakery market. I always like to share FoodNaviagator-USA’s special editions—collections of articles on one theme, in this case, what’s happening with snacks from the industry’s perspective. What’s hot in snacks? Sprouted grains? Posh jerky? Chickpeas? Gourmet marshmallows? What’s the difference between a meal and a snack, or are the lines becoming increasingly blurred? What’s a suitable portion-size? This FoodNavigator-USA special edition explores the hottest new trends and brands in the market. Jennifer Harris and colleagues at the Rudd Center have a study out in Obesity on how food companies are making products to meet the USDA’s nutrition standards for snack foods—but look just like the original products that don’t. These, the press release says, are confusing to parents and children. A fact sheet provides the evidence. Students believed that look-alike Smart Snacks and the less-nutritious versions of the brands sold in stores were similar in healthfulness and expected them to taste the same. This, of course, is the result of “nutritionism,” the defining of the healthfulness of a food by its content of specific nutrients—vitamins, salt, sugar, saturated fat. The “healthier” versions raise the question: Is a slightly better-for-you product a good choice? This is why food-based standards make more sense. Snack foods have a place in kids diets, but ideally a small one.